Every time I see a person selling packets of tissue paper along the street, a mental tussle starts within me–to buy, or not to buy? Is it alright to ignore them like what everyone else seems to be doing, or just go ahead and buy something to help them out that little bit? On Saturday I gave in to my desire to play my part and approached this old man. His bubbly nature and the winsome smile on his face surprised me, for someone who must have spent hours waiting at the same spot without any success. What he shared with me left me walking away feeling touched, somehow–for reasons I can’t quite put together. Perhaps it was the fact that I had been granted a glimpse into the life of a person who must at times seem as oft-un-noticed as the grass around him. “I sell here because I have a license! If you don’t the government will chase you out. It’s very hard to get a license. Today is good because there is a lot of people; it’s Saturday. But some days I don’t sell anything at all. 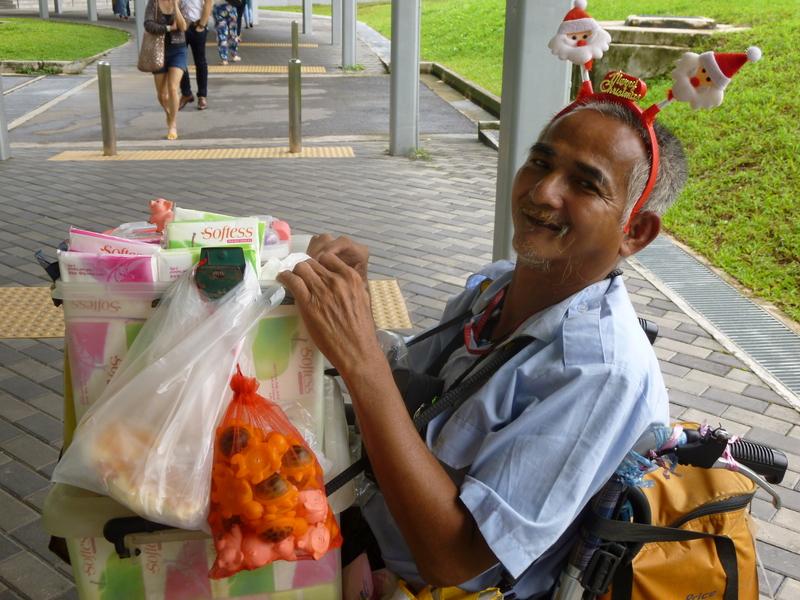 The tissue paper was donated by Sheng Siong, twenty boxes and all of it was free. The headband was bought for me by someone from a nearby store. I start work early every morning–this morning I started at twelve, and end every night at eight. I’ll take the MRT home by myself with this box; it isn’t heavy. I live by myself in Commonwealth. I used to live with my father, but then he passed on. I don’t like Singapore. I like travelling. I’ve been to many places–Malaysia, China. I travelled to China free because they paid for my expenses; I did volunteer work. There were basket-weavers in China who began working before they could walk. Little children; twelve years old. Now I stay here because I’m a Singaporean.